B's Beauty and Books: Beauty Post: How to make your own summer body scrubs! 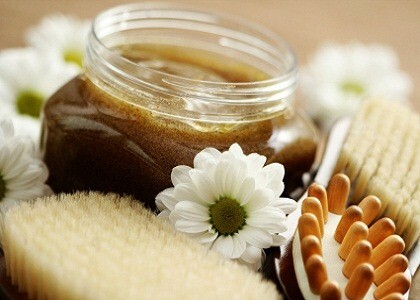 Beauty Post: How to make your own summer body scrubs! There are so many really cool ways to make a body scrub. In the summer our skin is exposed to the natural elements so much more than they normally are during the winter. After all, we have short shorts, mini skirts and bathing suits to pull off! So here is just a basic recipe with a few varieties that will get your skin summer ready! 1/2 Teaspoon of your favorite citrus essential oil. You can use any fragrance, but the citrus oil also helps remove the dead skin. And for those with really dry skin, add just a hint of honey. About 1 Tablespoon. Mix your oils, and vitamin E together first, then put in your sugar. The reason to use sugar is because in a shower it will dissolve and not leave such a mess. BUT PLEASE BE AWARE OF THE OILS! THEY WILL MAKE THE SURFACE OF YOUR SHOWER SLIPPERY! Scrub from your declotte (Shoulders and chest) down in small circular motions. Do not scrub hard and make sure you do this after you have been in the sun and not before. Like any exfoliation, your skin is more susceptible to burning if you exfoliate before you go into the sun. Rinse off scrub and again be sure to step carefully! You can use this method daily, although 3 to 4 times a week should suffice.